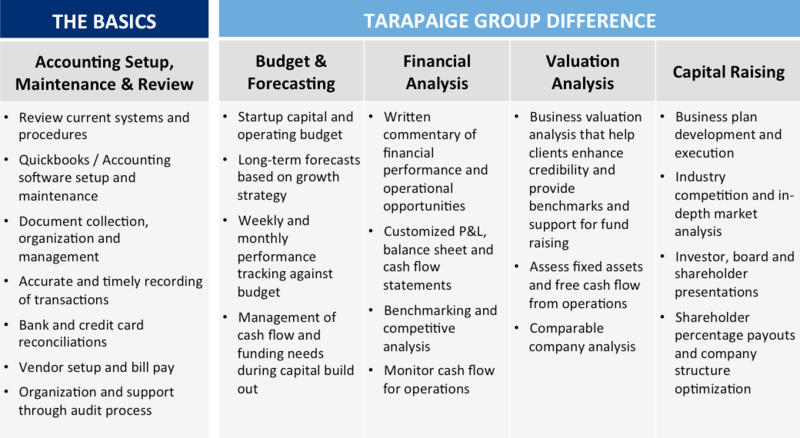 At TaraPaige Group, our job is to design and implement a financial management solution that provides business owners powerful insight into their operations. We partner with management teams and take a comprehensive and analytical approach to create and execute profit and value-enhancing solutions. As an emerging or growing enterprise, we understand the importance of maintaining robust financial reporting and monitoring key business metrics. We combine financial and operational expertise to provide unique information, benchmarking and analysis to enhance your understanding of your business and identify opportunities for improvement and growth. Our role goes beyond that of a traditional bookkeeper. As a foundation, we will implement and maintain an accounting management system that is tailored to your business needs. We work with management teams to review or develop financial models, improve financial reporting, evaluate operating metrics, and manage cash flow/working capital requirements. As a long-term strategic partner, we help to articulate your growth plan and provide the tools needed during critical phases of development. From early stage business plans to investor and shareholder presentations required to raise capital, we provide support during all stages of your company’s lifecycle.